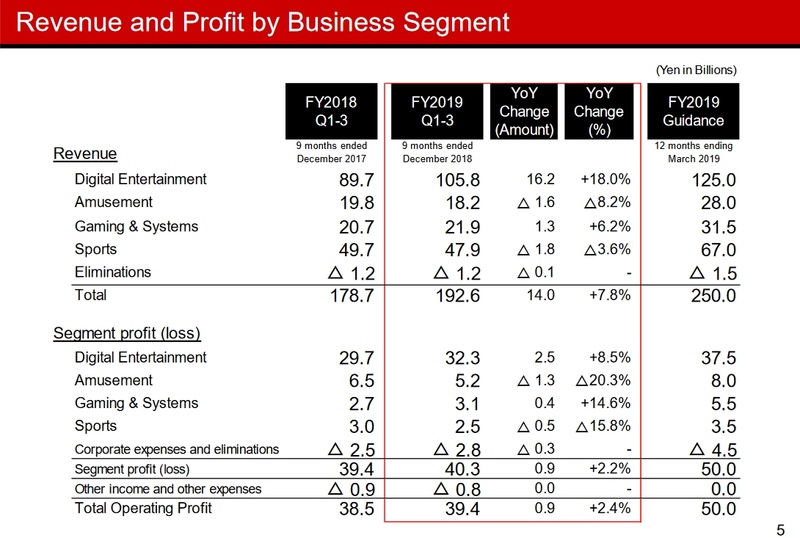 At the start of the financial year, Konami (TYO:9766) revealed that they’re expecting a strong year as a result of renewed investment in their Digital Entertainment (video games) section. While this hadn’t started to reflect during the second quarter, it has seemingly started to take effect now. 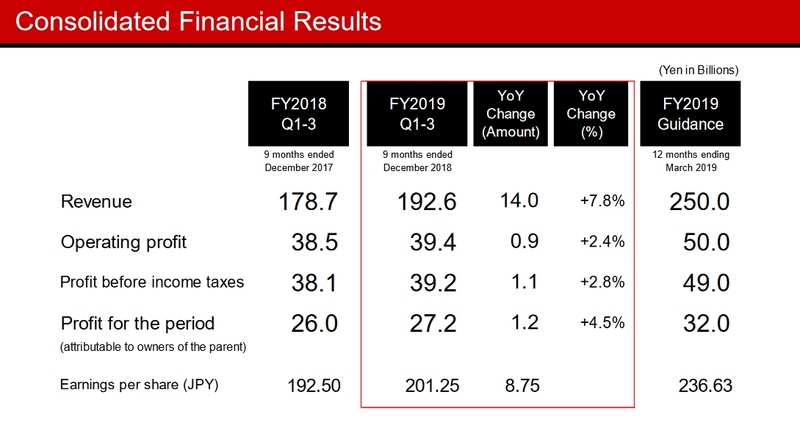 Konami has revealed in their financial results that revenue for the third quarter hit ¥70.4 billion, bringing the nine-month total to ¥192.6bn, a 7.8% year-on-year rise of ¥14bn. This continues the trend of previous quarters increasing in revenue. One trend that has been bucked is the YoY stagnation of profits. Third quarter operating profits hit ¥14.4bn, bringing the nine-month total to 39.4bn, a 2.4% YoY rise of 0.9bn. For a company that only four years ago was reportedly cutting back and effectively quitting traditional video games, that segment is the true cause of any growth. Revenue within Digital Entertainment for the quarter came in at ¥39bn, bringing the nine-month total to ¥105.8bn. This is a ¥16.2bn, 18% increase over last years ¥89.7bn. The cause from this hasn’t come from the new release of a global title, though they have had a few new releases. Pro Evolution Soccer 2019 (also known as Winning Eleven 2019) launched for mobile devices and, as Konami themselves have stated, “myClub, the online mode of Winning Eleven 2019 (known overseas as PRO EVOLUTION SOCCER 2019), has continued to perform well immediately following its release”. How this will be impacted in the future remains to be seen, as countries are starting to ban the use of in-game loot boxes as they breach gambling laws. Continuing along this trend of in-game spending, you see where Konami have truly found a boost. They specifically state “the preference for enriching daily life through full and abundant experiences in personal spending has been strengthened.” While this does apply to in-game microtransactions and loot-boxes like in myClub, it also applies to eSports. Pro Evolution Soccer is joined by Jikkyou Pawafuru Puroyakyu 2018, a baseball title, with both having professional eSports competitions. Furthermore, a number of titles have reportedly received updates to improve consumer engagement, which also assisted in boosting sales and revenue. Sales of Professional Baseball Spirits A increased, despite the title now being three years old, thanks to updates to the game. In addition, Konami has made large updates to Yu-Gi-Oh as this year will mark the 20th anniversary of the game. Two other areas related to games for the company are Gaming & Systems, which are gambling related machines, and Amusements, which are Pachinko machines amongst other arcade machines. Starting with Gaming & Systems we see an area that is showing a positive, though not to the extend of Amusements. The area has shown quarterly revenues and profits of ¥9.1bn and ¥1.5bn respectively. Nine-monthly now stands at ¥21.9bn, a 6.2% YoY increase in revenue and ¥3.1bn in profits, a 0.4% YoY increase. Gaming & Systems are reportedly seeing the start of a revitalization, according to Konami, who have continued the rollout of a number of systems, including one called Fortune Cup, which is a horserace betting station featuring a model track. Furthermore, there has been an expansion of content towards casino’s in which Konami has participation agreements with the operators in which profits are shared. Furthermore, there has been an increased rollout of their SYNKROS management system on cruise ships. On the non-gambling side, the trend is also positive, despite figures still being lower than those of last year. Q3 revenue came in at ¥6.9bn with profits of ¥2.1bn, bringing nine-monthly totals to ¥18.2bn and ¥5.2bn respectively. Revenue is now 8.2% lower, YoY, however, this is a boost compared to the end of the second quarter where it was 9.6% lower. Profits have equally improved, now being -20.3% compared to -33.3% three months ago. Part of this recovery has been attributed to “measures taken by the industry as a whole” which have made amusements more inclusive to both families and senior users. In addition to this, eSports have also had a part in this, with amusements also offer experiences – such as tournaments – to draw more people in. Specifically for Konami, they have mentioned a number of titles, highlighting the performance of Mah-Jong Fight Club Grand Master and Bombergirl. One area that is consistently performing poorly for Konami comes with the Sports section. Revenue for the third quarter has come in at ¥17.9bn, with profits of just ¥0.6bn. What was a YoY -3% in revenue and +2.8% in profits in the second quarter has turned into -8.2% in revenue and -15.8% at the end of the third quarter. Natural disasters, as well as investments in renovations and renewals, have been described as core reasons behind this. To improve matters there are always hopes of a more stable environment. Konami are also hoping that government initiatives, namely the aim to have a “sports society of all 100 million citizens” in their home country of Japan will increase football to their sports facilities too. For their own part, Konami have introduced pricing structuring to ease the costs and increase accessibility of their facilities. As it stands, the fourth quarter is likely to see a consistent fall for Sports, until all facilities are repaired and people make their way back to the gym. Amusements, as well as Gaming & Systems, are predicted to continue their moves through the release of new machines. With Amusements, Konami also has a subsidiary in Thailand that is looking to expand and further increase their reach. Digital Entertainment, on the other hand, has a number of mobile titles in the works. In addition to this, Yu-Gi-Oh’s 20th anniversary will likely have promotions based around it, increasing user spending. 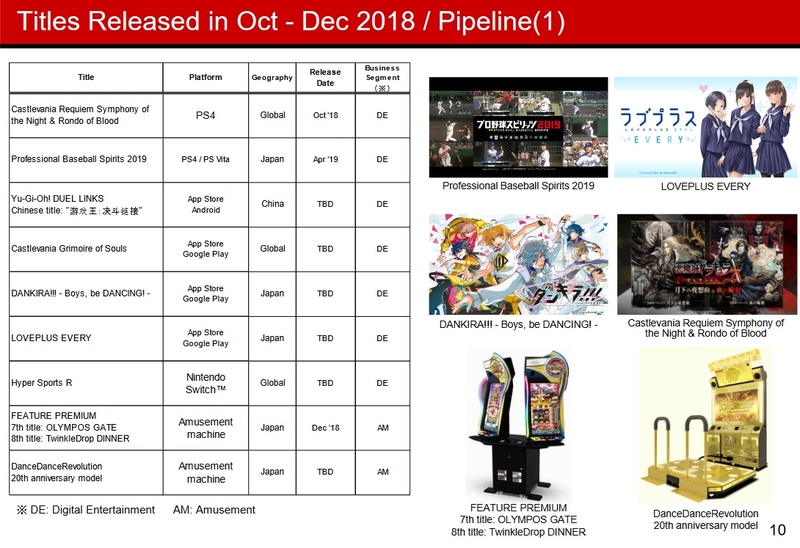 Konami also Professional Baseball Spirits 2019 releasing in Japan. eSports investment and engagement will continue throughout the current quarter and into next year, hopefully retaining consumer interest. As it stands, no major titles have been announced further afield.